Sometime last year, Sylvia and I were having dinner at my friend Ken's place. He'd recently got a copy of The House That Sam Built. Sam is one of my favorite designers. I love his simple, elegant and organic sense of design. This hall table was the piece that most captured my eye. At that time, I jotted a couple ideas down and when I got home I did some really rough sketches, until I found something I really liked. I let it stew a bit and after awhile came back to it and did this sketch. This was something I added to the list of projects I wanted to do. I planned to do this as a veneer piece with solid edging that I could sculpt round in a bow to Maloof. The order of things changed recently when Sylvia got fed up with our present couch and decided to get new living room furniture, which meant I had to actually hang the TV and build a console. 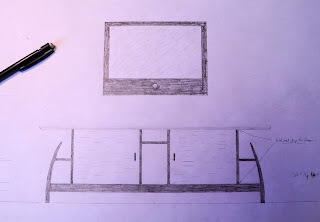 I also decided to tweak the hall table design. 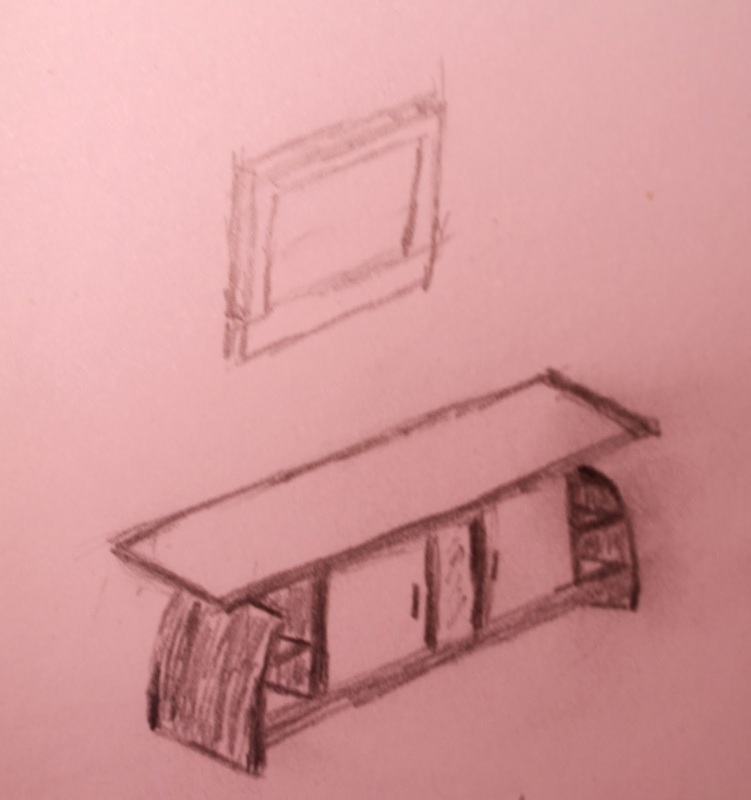 I sketched these two perspectives while Sylvia and I were watching something, so she could see what I was thinking and give some buy off before I started scale drawings. 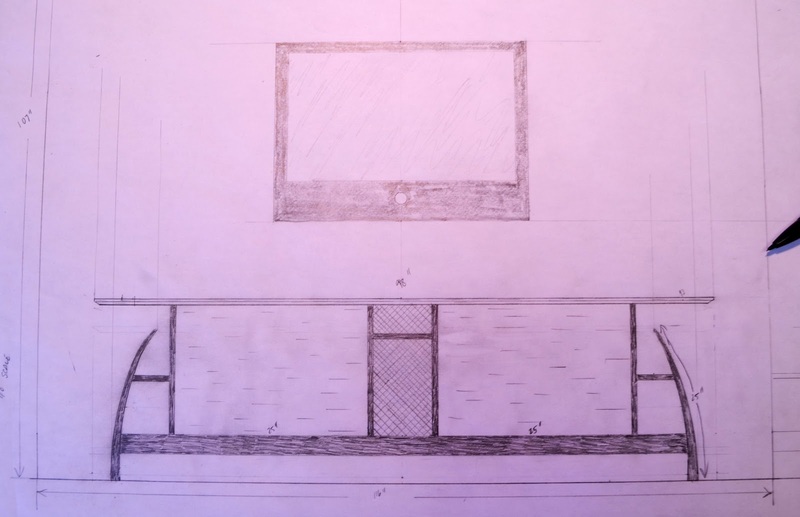 Based on the single point perspective and the actual measurement of the wall and all the components of the entertainment center, I produced this first drawing. At this point I put it out to my woodworking community on Facebook and Twitter. I got some really good feedback. Mark Cherry, a buddy on Facebook and @woodshaver101 on Twitter, has done a lot of cabinet style furniture and suggested, due to the length, I employ a torsion box in the design. Earl Kelly, again a Facebook buddy, thought the piece looked a bit stretched and after stepping back, I thought so, too. 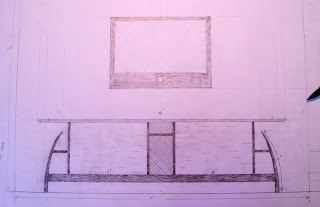 This is the final single point perspective with 5" trimmed from each side, all from the panels. The center section will sit just back enough for each front panel to bypass. 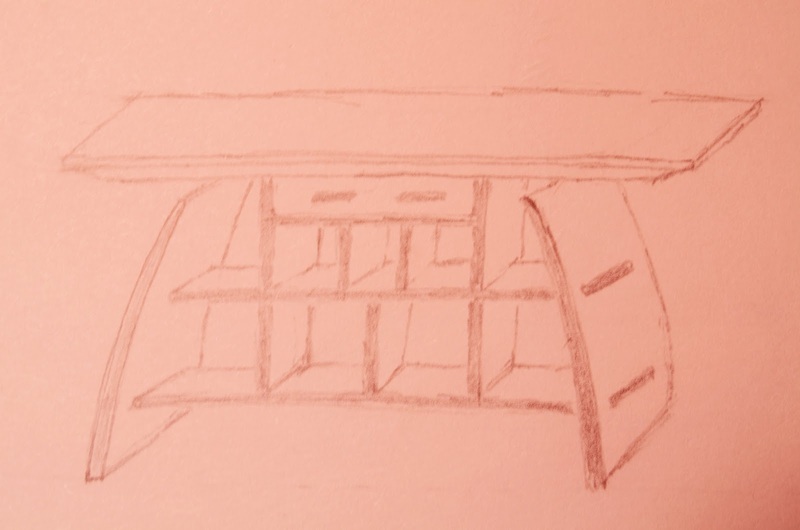 The bottom-middle is for the surround sound's bass reflex speaker, the center speaker will be directly above and the left and right front channels on each of the respective shelves in the curves. The choice for the material center panels is still up in the air. I was originally thinking metal and may still go that route. I just need to consider vibration. 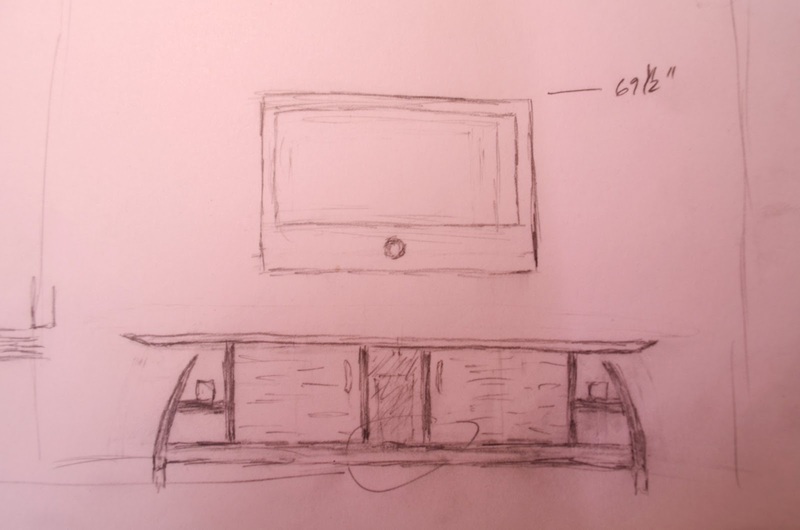 I'm planning on building this as a veneer piece. Under the right circumstance, I don't mind solid wood, but if the piece will benefit from man made materials, I'd rather go that way. I'm thinking the shop made veneer will be ~ 1/8 inch thick. The dark wood is Wenge and the top and panels will be Black Limba. I've still got some logistics to figure out, one being to find some good plywood. I'm looking forward to the build! I finally got around to making a strop. If you haven't added this last step to your sharpening process, I definitely recommend it. I could easily shave arm hair before. The difference is the same as changing out your shaving blade for a new one. Where it had started to pull hair a bit as the blade wore, a new blade glides with no resistance and leaves a baby smooth surface. For woodworking this means a cleaner cut for longer periods and when that blade does start acting a bit dull, just strop it. With the strop you can go much longer in between actual sharpening sessions. which is a favorite "construction" adhesive of mine. I like it because it cleans up with warm soapy water and doesn't have the horrible off gassing that many other construction adhesive create. I used a J - roller to makes sure the leather was solidly affixed to the plywood with no voids and as flat as possible. A bar of jeweler's rouge and you're done. You will be able to create a beautiful mirror surface and as you've been taught, a sharp edge is the junction between two dead flat surfaces. So, the fewer scratches in the surface the more likely you will achieve a good edge. This was easiest upgrade I've done yet. If you haven't already, go do it now. Totally worth the small amount of time.